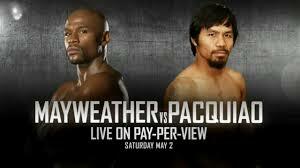 Pay-per-view operators in the U.S. had trouble handling the last minute rush of signups for the “Fight of the Century” on Saturday, forcing promoters to delay the start of the welterweight championship bout between Floyd Mayweather and Manny Pacquaio by 45 minutes as operators scrambled to process the late orders and maximize the take. In contrast, the live-streaming apps Periscope and Meerkat worked flawlessly — so much so that it was possible to watch the entire fight for free as thousands of “Meerkasters” and “Periscopers” turned their phone cameras to their TV sets and rebroadcast the official HBO and Showtime broadcasts. There were so many streams available that Twitter users were able to catch every round, even as Periscope and Meerkat scrambled to respond to DMCA takedown requests, simply by jumping from one stream to the next. There were also, of course, any number of free live streams of the fight available online for those who wanted to search for them, just as there are for any such big-ticket event, many of higher quality than anything you could see on Periscope or Meerkat. Boxing promoters in particular, in fact, have been battling pay-per-view piracy since the days of illegal, “black box” decoders in the 1980s and 90s. What Meerkat and Periscope bring to the mix is the power to make such piracy viral, social and mobile — and as easy to do as taking a selfie — potentially amplifying its impact. Many of the streams from the MayPac fight were poor quality, and none were better than second-generation rips created by pointing a cellphone camera at the TV screen. But that didn’t stop individual streams from registering 10,000 or more viewers at a time. Truth be told, many of not most of those viewers were likely casual fight fans, attracted as much by the novelty of the still-nascent mobile live streaming phenomenon and the lure of the big event as by a genuine interest in the fight. It’s unlikely that anyone who might have been inclined to buy the pay-per-view decided not to because they figured the could catch the fight on Periscope. But that in itself should be a red flag for content owners. As discussed in a previous post, unlike other types of on-demand media, Meerkat and Periscope are designed to push content out to end-users by leveraging the sender’s social graph. When a Twitter user launches a Periscope stream, her Twitter followers are automatically notified the stream is available and can be accessed with a single click. Meerkat worked the same way until Twitter cut off its automatic access to a user’s followers after the launch of Periscope. But Meerkat has now made the logical move of integrating its service with Facebook, which could actually increase its reach beyond what it could have achieved through Twitter alone. Thus, many viewers who might never have bothered to go searching for an illegal stream of the fight online were prompted to tune in, with a single click, by Periscope and Meerkat. HBO, which along with Showtime handled the PPV broadcast of the fight, was already alert to the potential danger posed by Periscope. Last month it sent takedown notices to Periscope after some viewers used the app to live-stream the Season 5 premiere of “Game of Thrones.” Sports leagues have also gotten hip to the danger. The National Hockey League recently warned accredited reporters that is a violation of their agreements with the league to live stream action from inside NHL arenas, including pre-game skates and locker-room interviews. But that same viral feature also holds enormous promotional potential for content owners and media companies. HBO itself, in fact, used Periscope before the fight to broadcast from Pacquiao’s dressing room. That may be one reason (along with their combined $400 million take) that neither HBO nor Showtime has said anything so far about Meerkat and Periscope piracy during the fight. But there will be plenty of gnashing of teeth over the issue as Periscope and Meerkat grow, and other mobile apps join the fray. It won’t be long, for instance, before entrepreneurs, for better or ill, figure out ways to improve the quality of second-hand live streams from a variety of sources, making them a viable substitute for the original. As it has done throughout the rest of the media ecosystem, mobility holds the potential to transform piracy by making it both more social and more personalized — and much harder to track and measure.